Nowadays it is difficult to play poker in USA because of legislation. Real money poker is not allowed and players have to search for other opportunities to play their favorite game. One of such opportunities is ClubWPT. It is a subscription based poker rooms where you have to pay for membership. The room is rather comfortable and offers many tournaments. You can create a new account and receive Free Trial access to all room offers right now. What are the benefits of being a member of the Club? Well, you will have access to more than $100 000 in prizes every month. You will be able to participate in a large number of tournaments where it is possible to win a lot of poker goods such as Pro glasses or Chip sets. It is always pleasant to get such great and expensive prizes. Money can also be won. Yes, the club is very good but you will have to buy membership first to get the access to all described prizes. In most poker rooms you have to make deposit and play using your own funds. It’s standard practice. But it’s a risky deal: you deposit your money and can play if you have funds left. Every time you sit at the table you take your money with you and put them at risk. ClubWPT uses different system. You need to pay only fixed monthly fee. After the fee is paid a player receives special Tournament Points. These points are equivalent of money, but the difference is that if you lose your points they will be automatically recovered. Do you see the difference? You don’t risk money at all! It’s difficult to believe but ClubWPT is the safest poker room in the world. You play there and never risk your own funds! As you see the system is very different from what you have seen before. That’s why most of players don’t believe and don’t want to join the Club. They don’t believe that there is a place where you can play poker games without risks and win money. It’s a big mistake! If you don’t believe you can try everything yourself for FREE! 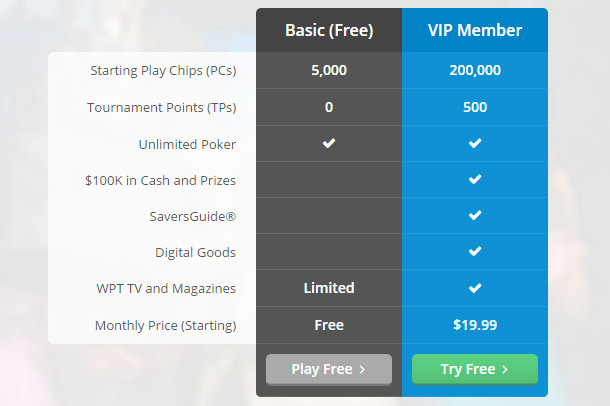 WPT Club offers free trial period to all players. It is a good option for those who want to try the software and see how the room works. Trial allows to participate in all tournaments and test all services. If you are interested in trying the poker room services before purchasing full subscription trial is for you. Your account receives temporary upgrade from Basic to VIP during this period. You will get full access to all parts of the website including ClubWPT magazine, different World Poker Tour videos and so on. You will get FULL access for 2 weeks for FREE. It’s a brilliant deal. All your winnings during this period can be withdrawn by you. Once again: you receive 2 weeks of free trial access to all Club games and services for free. Your Basic account will become VIP for a limited time. This period will help you to make a decision about purchasing full subscription. It’s an equivalent of Deposit Bonus promotion offered by traditional poker rooms. It’s easy to get this trial offer, all you need is to create a new account and log in. You will see special banner with an offers to claim your free access. You will have to fill in some details and that’s all. The period lasts for 2 weeks. During this time you will have full access to all features, offered by the poker room. So if you do not know to buy or not to buy full subscription – take a trial and you will understand everything. After the trial period is over you will be asked to continue as VIP member by purchasing subscription or to continue as Basic member. Nobody will force you to pay. If you will decide to continue as VIP you will have to purchase one of subscription plans. The best offer is to purchase yearly access. You will save a lot of money compared to month by month payments. ClubWPT is the most well-known place where a lot of people from USA play online poker. Actually it is the best place for US citizens. Several weeks ago the club added Australian players to its base. So it becomes bigger and bigger. Join it now and have a lot of fun playing your favorite game.